Some useful tools for the home cook/baker. 1. 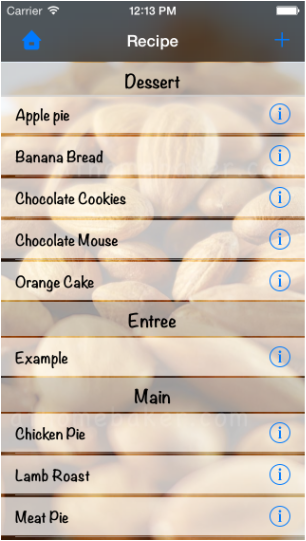 Ingredient List - designed to allow you to easily create and access a handy list of ingredients and the quantity of each ingredient for your recipes. Simply add the ingredients and the quantity under the name of a recipe. 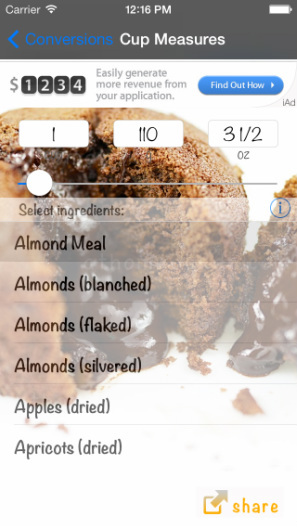 You can even put down notes and modify the ingredients as you refine your recipe over time. Bring the list along for your shopping. (The free version is limited to 9 saved recipe only. Adapt the quantity. 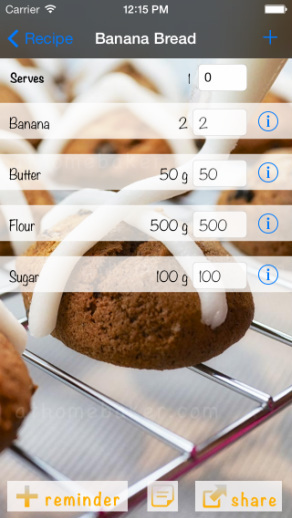 A very useful feature is that the list helps you easily adapt the recipe for different quantities. Simply enter the number you want in one of the text field and the quantity of all other ingredients will be updated proportionately. Alternatively, change the number of serves, and the ingredient quantity will update automatically. Share it. You can share the ingredients with your friends via email, facebook, twitter, etc. Dropbox. You can export/ import your recipe to your Dropbox. This is a great way to save a backup copies of your favourite recipe. (ii) Cup measures - convert between metric, cups and imperial for various ingredients, e.g. if the recipe say 2 cups of raisins, what is that in terms of gram or ounce? 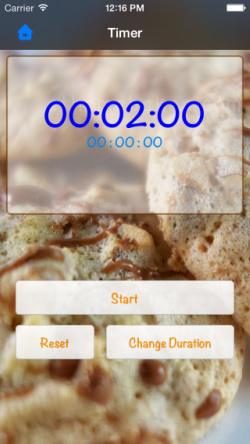 Check out our Gourmet Cooking Timer app too - it has the same basic feature set as the Cooking Timer in the AtHomeBaker app plus many more. Designed to work on all iOS device running iOS 6.0 or above. Optimized for iOS 7. If you like this tool, come visit us - athomebaker.com. Here is where you can list and add the name of your recipes. Click to see the Ingredient list (see below). Click the blue disclosure button to see/ change the details of the recipe. You can add some notes here too. To delete: simply swipe right on the row and click the "delete" button that appears. This list the ingredients and their quantities. To add an ingredient: click the "+" button. To delete an ingredient: simply swipe right on the row and click the "delete" button that appears. 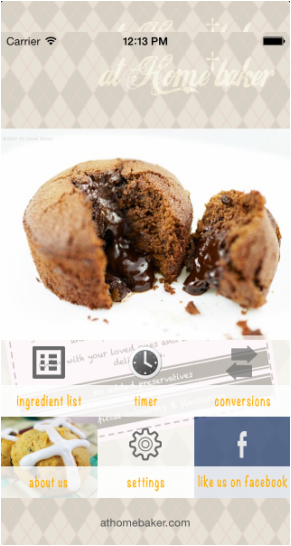 To edit each ingredient: Click the blue disclosure button to see/ change the details of the recipe. You can add some notes here too. Enter the desire quantity for one of the ingredient in the white Text field. Then click 'Done' and the quantities of all other ingredients will be updated proportionately based on your input. e.g. change number of egg here to "8" will change the butter to "500g", chocolate to "500g", etc. This allows you to convert between metric, cups (metrics), cups (US), cups (Canadian), imperial, teaspoon (metric), teaspoon (US), teaspoon (UK), tablespoon (Australia), tablespoon (UK), tablespoon (US). To convert, simply enter the desire quantity in one of the Textfield and click "Done". 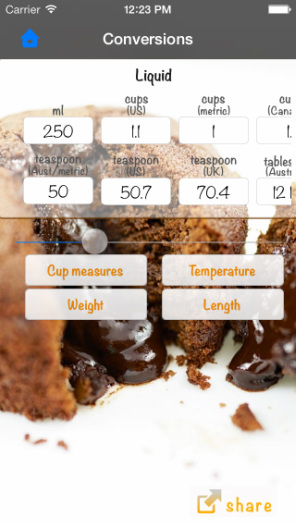 This allows you to convert between metric, cups and imperial for various ingredients, e.g. if the recipe say 2 cups of raisins, what is that in terms of gram or ounce? Simply select the ingredient from the list. Then enter the desire quantity in the white Textfield and click "Done". This allows you to convert temperature. Simply select the input unit on top and enter the temperature. 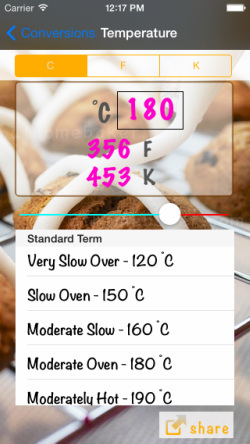 Or you can also use the slider to increase and decrease the temperature. The timer is simple to use and will continue to remind you even if you are using the other functions of this app or even if the app is not currently active (provided that notification is enabled). (ii) the total duration from the original start time. To stop the timer: click Stop. This will also stop all notification. To reset the timer: click Reset. Changing duration: click Change Duration. The duration can be set on the pop up screeen before you start the timer. You can also change the duration whilst the timer is running; doing so will change the duration of the currently running timer without altering the start time. For example, this is useful if you want to increase the baking time after you have started the timer.